Indira Gandhi or Indira Priyadarshini Gandhi was one of the eminent and powerful politicians of her time in India. She was the only child of Pandit Jawaharlal Nehru who was the first Prime Minister of India. 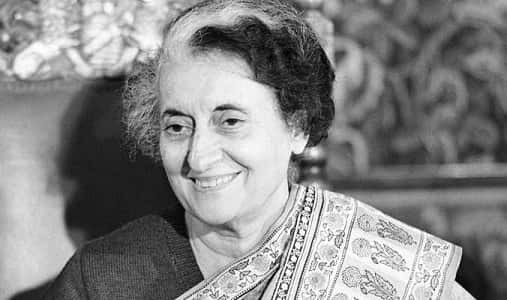 Indira Gandhi was the first woman Prime Minister of India, the longest serving woman Prime Minister of the World and the second longest-serving Prime Minister after Jawaharlal Nehru. She served as the Prime Minister of India for three successive terms from the year 1966 to the year 1977. She served the fourth term from the year 1980 till she got assassinated in the year 1984. Her son Rajiv Gandhi also served as the Prime Minister of India later. In spite of her surname Gandhi, she was not related to Mahatma Gandhi in any way. Basically Gandhi is a very common surname in Gujarat hence she took this surname. Born on the 19th of November, 1917 to Pandit Jawaharlal Nehru and Kamala Nehru, as Indira Priyadarshini Nehru in Allahabad. Her father Jawaharlal Nehru was a leading politician during the Indian struggle for independence and eventually became the first Prime Minister of free India as well. Motilal Nehru, her grandfather, was also one of the prominent leaders of Congress and independence movement. Her childhood wasn’t very unhappy and lonely. Her father was usually away due to political reasons and mother was usually down with illness. She was in a very limited touch with her father and it was mostly through letters. Eventually her mother died due to tuberculosis and she started participating in politics along with her father, hosting his events and accompanying him on political travels. She was her father’s most trusted confidante till he died. On the education front, she was tutored mostly at home and then in various Swiss schools since her mother was admitted in Switzerland for her treatment. Eventually she attended Shantiniketan’sVisva-Bharati University in Santiniketan, West Bengal and then England’s Somerville College, University of Oxford for a period of one year each. It was Rabindranath Tagore who named Indira as Priyadarshini and she got famous as Indira Priyadarshini Nehru. She formally joined Indian National Congress party in the year 1938. In 1942, she married Feroze Gandhi whom she met while being in Britain. She knew him from Allahabad and as a fellow member of party. He was also studying there at the London School of Economics. He had no relation with Mahatma Gandhi also and rather belonged to the Parsi family of Gujarat. Both of them got blessed with two sons, Rajiv Gandhi and Sanjay Gandhi in the year 1944 and 1946 respectively. However, this marriage didn’t last long as initially they were estranged for most of their marriage and then Feroze died in the year 1960. While accompanying her father on various events, Indira gathered much of her political prowess. She was mostly interested in activities related to social welfare, especially Children’s welfare. Indira Gandhi progressed toward becoming the leader of the Indian National Congress in the year 1959. The Congress had driven the nation to freedom and had then turned into its main and foremost political party. She joined Congress in the year 1938 and in this manner filled in as an important member from the Youth Advisory Board and administrator the Woman’s Department of Congress party. Before assuming the presidency of the association, Indira Gandhi was named to the Working Committee of 21 executive members. She was chosen with a greater number of votes than some other contender to the dominating 11 member Central Election Board. This board was responsible for naming competitors and planning the strategy of the electorate. In the June of the year 1964, after her father’s passing, Indira Gandhi moved toward becoming minister for Information and broadcasting in the team of ministers of the then Prime Minister Lal Bahadur Shastri. In the January of year 1966, when Shastri kicked the bucket, she was chosen as the pioneer of the Congress party in the Parliament and eventually turned into the third Prime Minister of free India. She started office at very crucial time ever in the history of the nation. A ceasefire had finished the war of 1965 among India and Pakistan just seven days prior. The country was amidst a two-year drought bringing about extreme shortages of food and it extended to the financial emergency with rising of joblessness among the Indian youth and prices of the essential commodities. The political repercussions of these challenges were significant. In the fourth general elections in the year 1967, the Indian National Congress party held larger part of control and chose Indira Gandhi as its leader, however lost all control in almost 50% of the state law-making bodies. Following 20 years of political strength, the Congress party experienced genuine trouble. Indira Gandhi quickly started revamping the party in order to make it a more successful instrument of national advancement and administration. Her objective was to accomplish a more extensive proportion of financial and social equity for all Indian citizens. As her left-of-focus strategies turned out to be clear, there was a split that happened in the Congress party. More youthful and more liberal started combining around Indira Gandhi and the more seasoned, more traditionalist leaders of the party began contradicting her. This division reached a crucial stage in the July of the year 1969 when she nationalized the 14 driving banks of the nation in an exceedingly well known move intended to make credit more accessible to smaller industries and agriculturists. The split in the party was formalized when a candidate of Indira Gandhi’s party – V.V. Giri – stood up for the presidency of India, and prevailed upon the legitimate nominee of the party. In spite of the fact that Gandhi took 228 individuals from Parliament with her into the newly formed Congress, it was still not a lion’s share in the house of 521 members. She eventually held power just with help from the left parties. In the December of the year 1970 when Indira failed to get the fundamental help to cancel the privy purses and benefits of the previous princes, she approached the President to dissolve the Parliament. Subsequently Midterm elections were set up for the March of year 1971, and it was just one entire year ahead of the timetable. An alliance of anti-congress socialist party and three parties of the right contradicted Indira Gandhi, who made unions with Left Parties and some provincial parties. She and her parties basically aimed on accomplishing social and monetary change all the more quickly with an end goal to enhance the personal satisfaction of people of India. Obviously the people supported her and her party won an enormous triumph with over a 66% majority in the Parliament. Gandhi confronted significant issues in the domains of populace control, food production, and reforms of land, regulation of costs, industrial production and joblessness. The issues were exacerbated by the convergence of very nearly 10 million refugees because of the common unrest in East Pakistan.In the month of November in the year 1971 Indian troops crossed into East Pakistan to battle Pakistani powers. Eventually Gandhi declared diplomatic recognition of the Bangladesh government set up by the revolutionary leaders of the East Pakistan. After ten days the commander of Pakistani army surrendered to India in East Pakistan. In the elections of the state that were held in India in the month of March in the year 1972, Indira Gandhi’s New Congress party recorded the most overpowering triumph ever of the nation; be that as it may, her rivals blamed her for damaging the laws of the elections, and a high court maintained the charge in 1975. As a result of this move, and also local turmoil, Indira Gandhi pronounced a highly sensitive situation called Emergency and deferred elections. Subsequently in the elections of the year 1977, Indira Gandhi and her New Congress party endured significant annihilations. Indira Gandhi lost her seat and the prevalence over the nation. The next year she led the Congress party group as she came back to Parliament. In the year 1979, she again became the Prime Minister of the country. In endeavours to demonstrate non-alliance of India in the worldwide network, she made it a point to visit both the USSR and the United States. Meanwhile, back in the country, riots broke out among Hindu, Sikh and Muslim religious factions. Sikh separatists anchored weapons inside their consecrated Gurudwara Golden Temple in Amritsar, accepting religious assurance. In order to counter the insurgency in Punjab, Indira Gandhi requested government troops to storm the Golden Temple, prompting numerous Sikhpassings. Indira Gandhi was assassinated on the grounds of her own official residence on the 31st October 1984, by her very own Sikh security guards as a revenge for the outbreak in Golden Temple. She was succeeded by her son Rajiv Gandhi as the Prime Minister of the nation who served till the year 1989. She was cremated near Raj Ghat and that place is now called as Shakti Sthal. The leader of the opposition party Atal Bihari Vajypayee referred to her as Goddess Durga after the victory of India over Pakistan in the year 1971. Indira was elected as Prime Minister twice. First, after the death of Shastri and second after winning the elections of the year 1971. She gave the slogan “GaribiHatao” in the elections of the year 1971. She gave the popular speech at the Secretariat of Orissa on 30th October 1984 and the very next day she was assassinated. Her fearlessness, determination and bold decision making quality got her the title of “The Iron Lady of India”. She also worked to decrease the birth rate of India so that the country could grow and develop like other nations. The assassination of the first lady prime minister of India was surely a jolt to the nation as she was one of the powerful personalities who framed many policies for India.